Düsseldorf Germany is an ideal one day city. 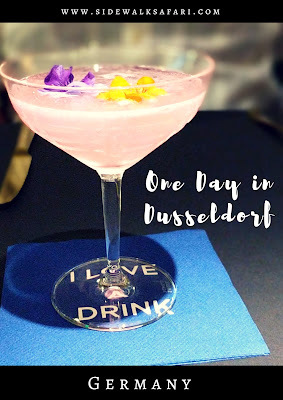 You might find yourself in Düsseldorf on business like I did and try to carve out some time for fun. There are plenty of things to do in Düsseldorf in a day. Along the way, you can discover what Düsseldorf is famous for and answer the question: is Düsseldorf worth visiting (spoiler: it is). When I visited Düsseldorf, I was staying at a conference hotel not too far from the airport: the Hilton Düsseldorf. Just a short walk from the hotel, you'll find Theodor-Heuss-Brücke U-Bahn station (in this case, an above-ground tram). Stop for breakfast or brunch at Goldscheim Coffee depending on how early of a start you decide to get. I opted for a savory turkey and cranberry bagel washed down with a creamy iced coffee. 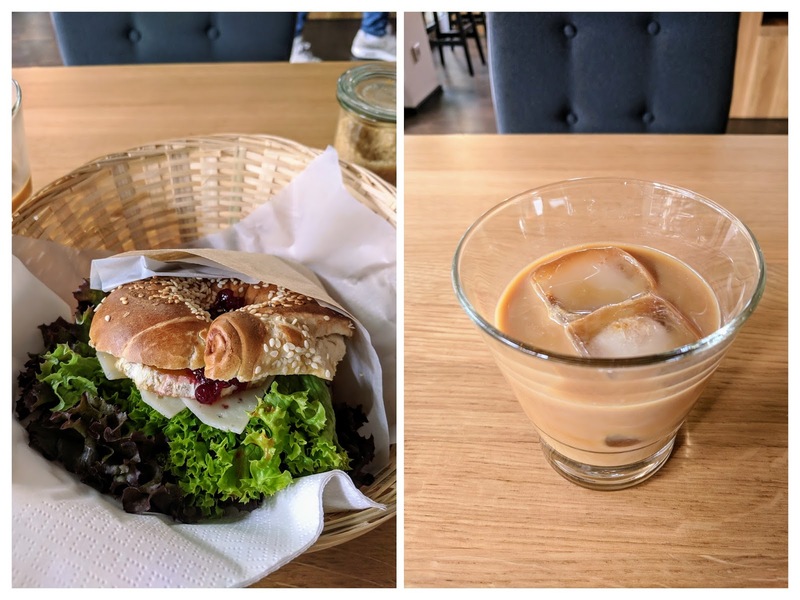 Goldscheim Coffee is one of the more highly rated coffee places in Düsseldorf and has a great vibe plus some outdoor seating if the weather is nice. Forego the tram and take a walk along the Rhine River after breakfast through Rheinpark Golzheim. This green space along the Rhine in Düsseldorf is lined with old-growth trees and adjacent wide-open fields. Check out the textures created by the bridges over the Rhine and look for the distinctive Rheinturm, a concrete communication tower that dominates the Düsseldorf skyline. It takes about 20 minutes to walk Rheinpark Golzheim from end-to-end. Keep walking past Museum Kunstpalast and then duck into Rheingärtchen. I was surrounded by riotous orange flowers and enchanting sculpture when I visited in August. The path along the Rhine will ultimately lead you into Düsseldorf Altstadt. Admire the spires and sturdy clocktower. Follow the path of yellow orb lights and scope out the restaurants and bars below along the river. At this point, leave the Rhine behind and duck into Düsseldorf Altstadt and seek out Düsseldorf Altes Rathaus. The picturesque Düsseldorf Old Town Hall will keep you busy for a while especially if the weather is nice. Explore the shops of Düsseldorf Altstadt at your leisure but definitely make time for a stop at Gut and Gerne chocolatier. Pick out a few truffles or a large dark chocolate filled with ganache for later. 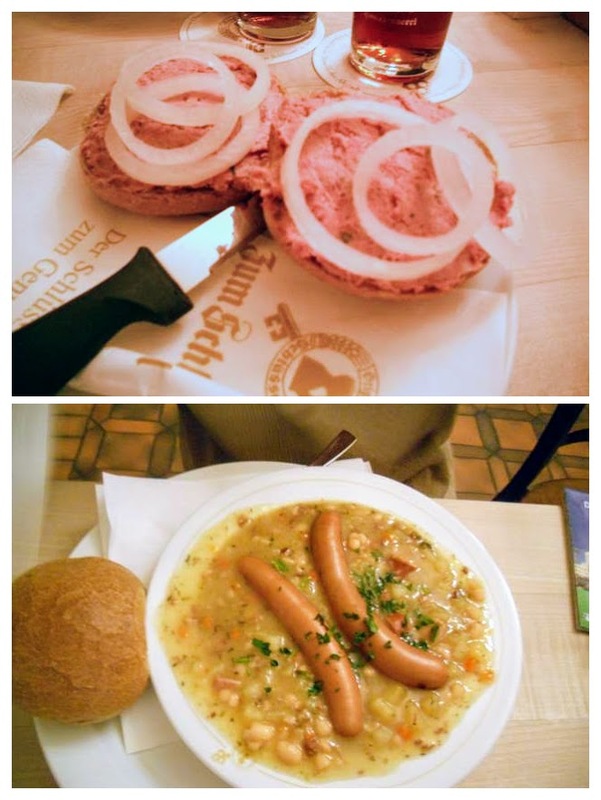 We tried leberwurst and onions and sausage in lentil soup for lunch. Continuing on, you'll pass a sunny yellow church. Take a moment to pop inside. The interior is ornately decorated with an impressive organ. Continue walking along Flingerstrasse until you emerge at Königsallee. If the weather is nice when you visit Düsseldorf this is a great spot to sit and eat your chocolates from Gut and Gerne. That is, if you still have room after your filling lunch. Stadtgraben is a small waterway that runs through the city along Königsallee. 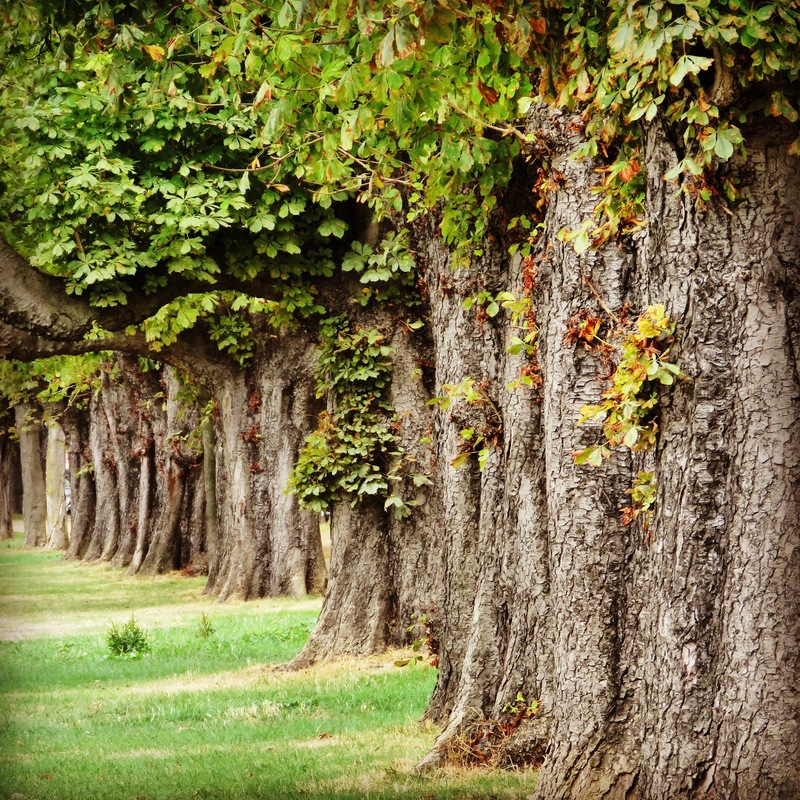 Take some time to photograph the statues and ornate lampposts that pop out along the tree-lined path. Take a walk through the Hofgarten and admire the ducks chilling out on the canal running through the lower end of the park. I was delighted to find a mirrored structure just behind Dreischeibenhaus. In the afternoon, the light plays off the shiny surface making for great photographs. Make your way toward the towering brick spire of Johanneskirche and admire the architecture outside (and in if the doors are open when you pass by). If you're feeling ambitious, walk along the river for a while toward the Düsseldorf MedienHafen. Medienhafen reminded me a bit of some of the neighborhoods that we walked around in Hamburg Germany. Walk past the Rheinturm which seems to be reaching for the sky. When I saw the white building below in the distance, I knew it looked familiar. It looks just like that Stata Center at MIT and could only have been designed by one person: Frank Gehry. Walk over for a closer look. There are actually three Gehry buildings next to each other: one white, one silver, and one red. We walked further into MedienHafen and admired the creative buildings across the channel. Take public transport back to your hotel to freshen up for dinner. If you can get a reservation and if you are up for a splurge, definitely make a booking at Fritz's Frau Franzi. I was visiting Düsseldorf for a conference and a colleague made a booking here and invited me along. 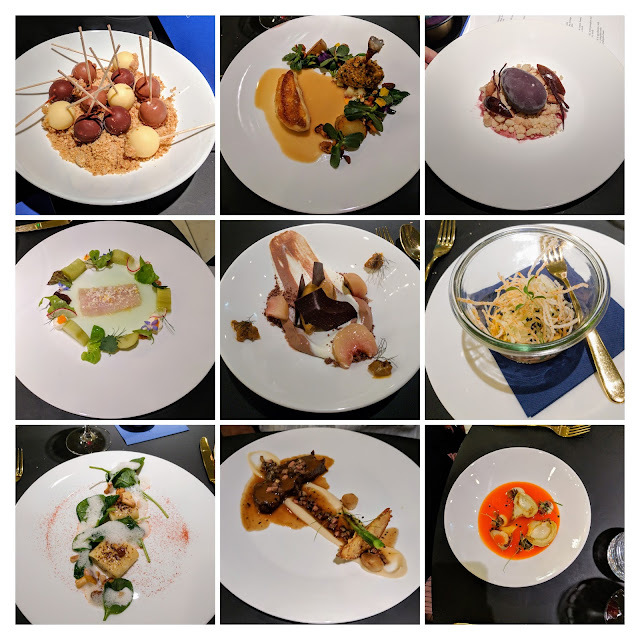 I didn't have time to do much research and it was only when I showed up and started reading the menu that I realized: Fritz's Frau Franzi is Michelin-starred! It's a good thing that Fritz's Frau Franzi is not a stuffy old school Michelin-starred restaurant or I would have been terribly under-dressed. The restaurant most definitely had a cool and modern vibe with the waiters wearing shirts with ties and sneakers. I felt right at home. We enjoyed some amazing dishes paired with a bottle of German Spätburgunder (Pinot Noir). The plates are served almost tapas-style and it's recommended that each person pick out 3-5 dishes. There you have it! An ideal one day itinerary for Düsseldorf. Check out the handy Düsseldorf map below which highlights our route and Düsseldorf points of interest. Spend one day in Düsseldorf Germany. 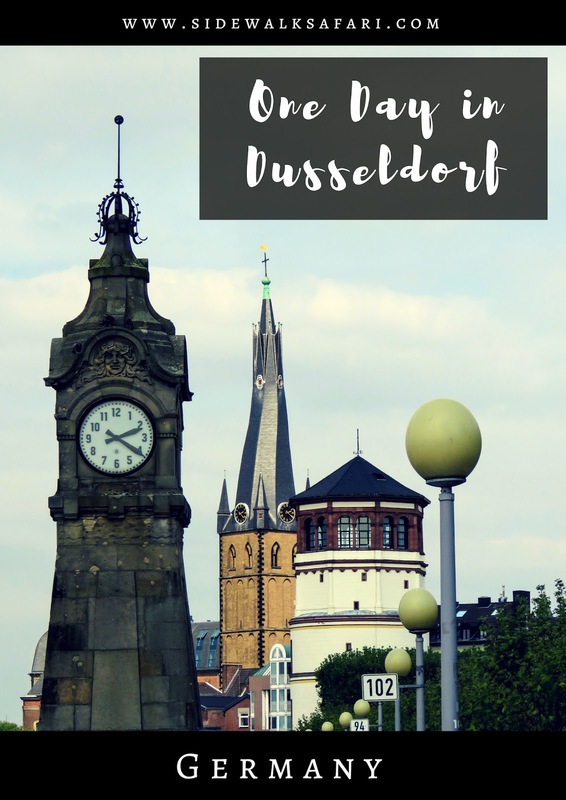 Explore an ideal one day Düsseldorf itinerary. Learn about things to do in Düsseldorf in a day. Find out what Düsseldorf is famous for and if Düsseldorf is worth visiting.